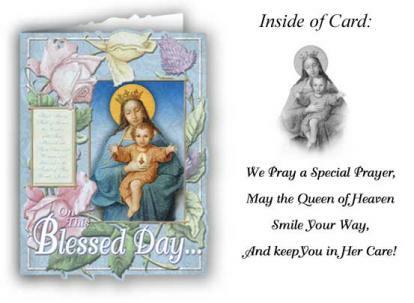 Large 5½ x 7½ Greeting Card This card is great for: CHRISTENINGS BIRTHDAYS MOTHERS DAY FEAST DAYS Front of Card has the Hail Mary and reads: On This Blessed Day Inside of Card reads: We pray a special prayer, may the Queen of Heaven smile your way and keep you in Her care! 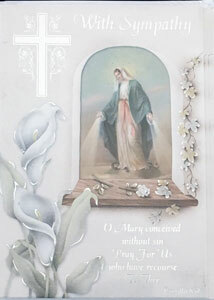 Back of Card explains the Hail Mary. 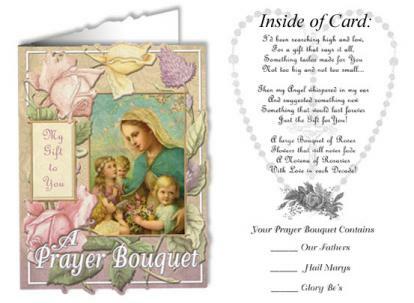 Large 5½ x 7½ Greeting Card This prayer bouquet card has a beautiful poem inside with space to mark prayers that are offered for the recipient. 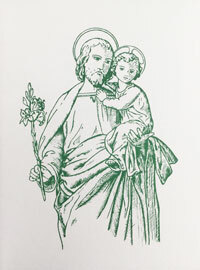 The back of the card has an excerpt on "The Power of Prayer" from the "Blessed be God" prayerbook. 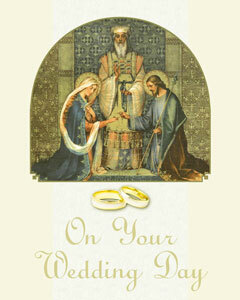 Large 5½ x 7½ Greeting Card Let us make sure nobody forgets whose birthday we are celebrating this year! 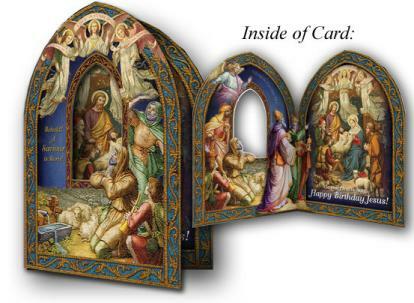 Send them a card that says “Happy Birthday Jesus!” The shepherds on the outside of the card are able to see the Holy Family through the cut out window. Open the door, and the shepherds are joined by the wise men. Full Color inside and out! Very beautiful! 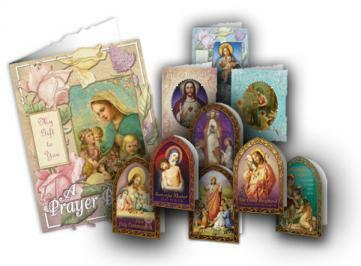 Buy 25 or more greeting cards (1000-1010) and SAVE! Mix and Match, no minimum per design! 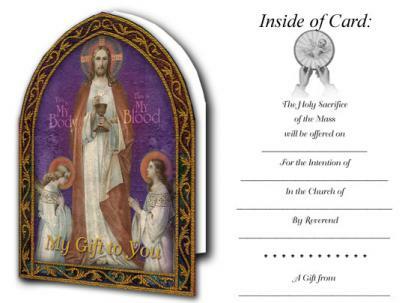 Get one of each Greeting Card GC1000-1009 at a HUGE SAVINGS. 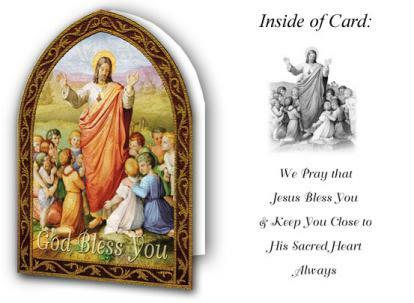 Large 5½ x 7½ Greeting Card Assortment. 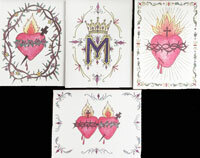 1 each of 10 different designs GC1000-1009. 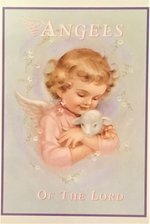 (We are out of the Birthday Card, and will substitute) A great value at only $2.40 a card this way! 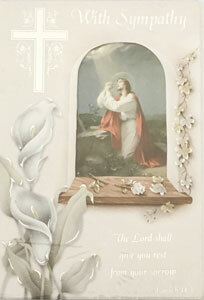 4 x 6 1/4" H Beautiful Mother's day card white with gold lettering on front. 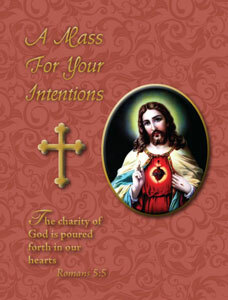 Inside reads: May God whose generosity can never be outdone reward your goodness always. Inside left: "I lift my eyes toward the mountains: whence shall help come to me? 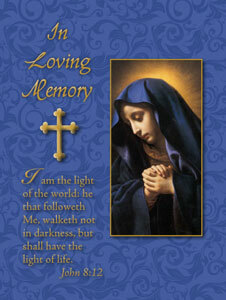 My help is from the Lord, who made heaven and earth." 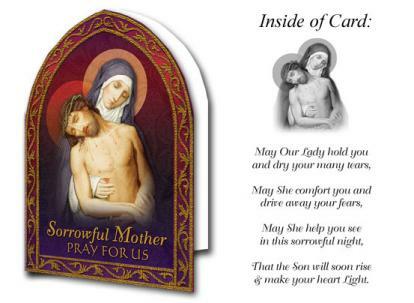 Inside right: "May God be with you and comfort you in your time of sorrow." Inside left: "I lift my eyes toward the mountains: whence shall help come to me? My help is from the Lord, who made heaven and earth." 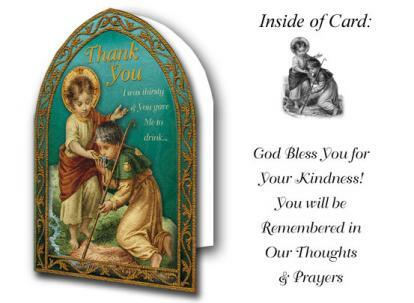 Inside right: "May God's loving presence fill you with strength and hope in this time of sorrow."